AVT completed the design and specification of pipework dampers on the AN6 Coolant Drum pipework at a site in Middlesborough. This was instigated following a vibration survey which indicated high levels of vibration which exceeded the Energy Institute ‘Concern’ line. AVT recommended that 2 No. set of 2 No. GERB Visco Elastic Dampers (RHY-80-V30/H30) were installed on the AN6 Coolant Drum pipework to provide damping in parallel with the Carpenter and Paterson (C&P) spring supports. The challenge was to design a means of securing the dampers to the pipework sharing the existing structural steelwork that supports the C&P spring supports. The advantage being the dampers would not affect significantly affect the dead load of the pipework and hence the original pipework design calculations but would passively add a significant amount of dynamic restraint. 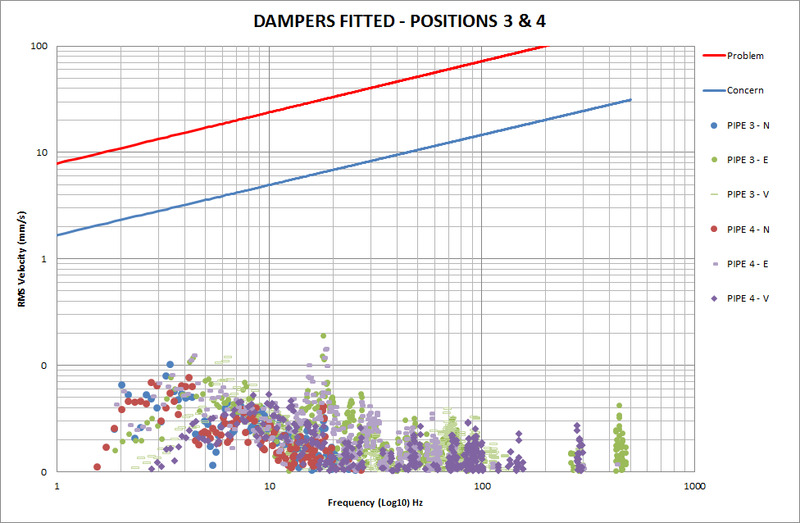 The damper installation resulted in significant reduction in vibration levels and this was confirmed by before and after vibration measurements as shown below. AVT completed the validation of GERB dampers on T504-S504 pipework on an acid plant in the North East. An initial vibration survey was carried out to confirm the levels of vibration following concerns that significant movement of the pipework was observed. AVT specified the damper type and supported the design of the damper support brackets through Finite Element Analysis of the local structure to check for sufficient structure stiffness to resist the loading. Steelwork designs were reviewed by AVT before being released for manufacture. AVT recommended that GERB dampers were installed to help reduce the levels of vibration of the main pipelines but would allow for any thermal expansion of the pipework. AVT completed the validation testing of the pipework damper installation on E506 steam pipework following an initial site visit to measure vibration levels which exceeded the Energy Institute ‘Concern’ line. AVT recommended that the work was carried out in two stages to firstly assess the benefit on installing a single damper where there was access before considering the installation of a second damper where significant structure steelwork would have to be added. AVT recommended a GERB Visco Dampers (RHY-20/V30/H30) to be installed on the top section of pipework that was easily accessible which also indicated the highest levels of vibration. Following re-balancing of the fin-fan cooler fans, significant structural and pipework vibration was observed, even though they have been balanced within acceptable limits. There were concerns that the building structure and current pipework supports may not be adequate and so AVT were asked to investigate and to provide advice on what remedial action could be taken to ensure the pipe work and structure operate within acceptable vibration levels. 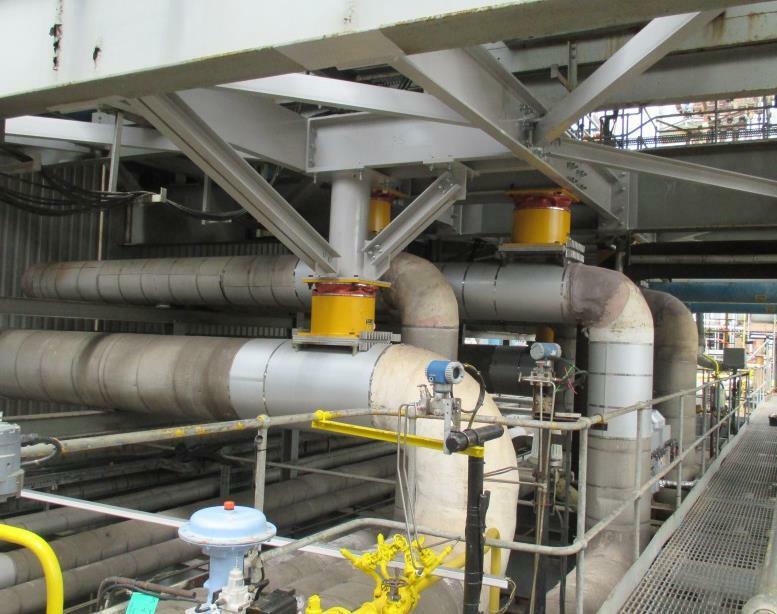 The investigation involved taking multichannel vibration measurements to understand the behaviour of the pipework and building and subsequent assessment of introducing temporary bracing on the vibration levels. AVT recommended the pipework was constrained using a combination of fixed struts and GERB dampers. The dampers were specified by AVT and supplied by GERB. AVT’s challenge was to also design a suitable support bracket to support the GERB dampers to existing beams that were about 1m away and could resist the damper loads. 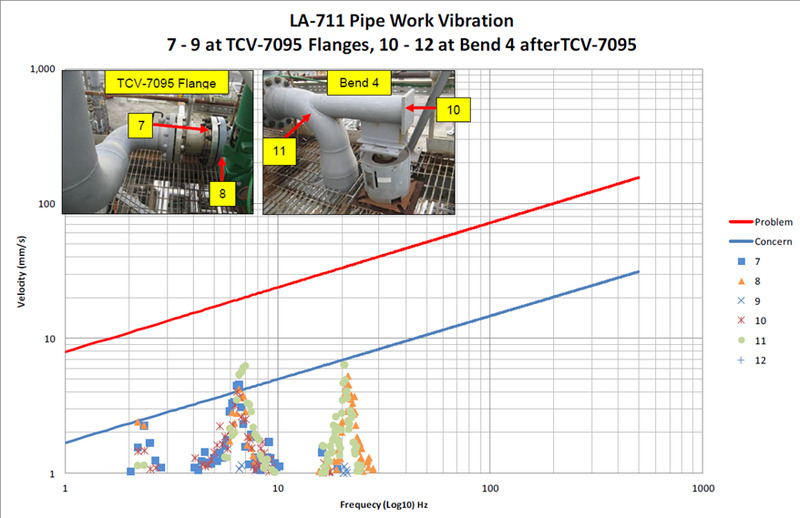 The damper installation resulted in significant reduction in vibration levels and this was confirmed by before and after vibration measurements in March 2012 as shown below. AVT recommended a GERB RHY-20/V30/H30 damper to be installed on P517 pipework following a vibration survey which indicated levels of vibration above the EI ‘Concern’ line. AVT specified a suitable damper to the client and they subsequently initiated the design of the damper support structure with their Design & Drawing office. AVT provide a design review service to ensure the support structure design had sufficient structural stiffness to resist the damper loads in order to reduce the levels of vibration. AVT carried out a review of the damper support structure and recommended that the design was modified to remove the cantilevered support shown in drawing below and position damper between cross beams with diagonal struts back to the column to provide increased stiffness. The damper installation in resulted significant reduction in vibration levels and this was confirmed by before and after vibration measurements as shown below. 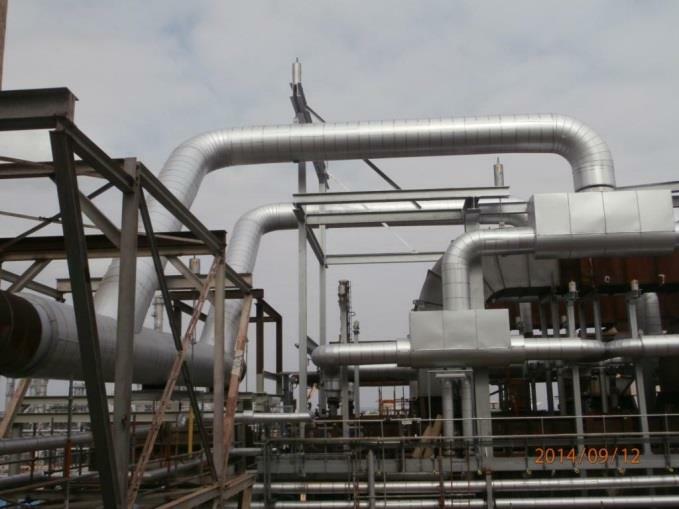 Following a major structural failure of a furnace and subsequent replacement of the pipework supports, the crude oil transfer pipework was found to be showing high levels of vibration upon start-up of the plant. AVT visited site almost immediately and reviewed the pipework vibration data collected by the client. To accommodate this, AVT arranged for the 8 No. RHY30/V70/H70 to be individually supplied with the required datum offsets between the top and bottom mounting plates in the x, y & z planes, so that the damper positions would be optimised during normal operating conditions. In addition, AVT specified the correct thickness of a special high stiffness thermal insulation material between the hot steelwork and the top mounting plate of the Visco-Damper. AVT were asked to review the structural steelwork design with the fabricators on site and were able to offer some suggestions to improve the lateral stiffness with minimal re-work. Following the steelwork remedial work the subsequent vibration levels were found to be satisfactory. The before and after vibration measurements were taken by the client and in terms of AVT’s concern factor the vibration levels in reduced from a CF of 9 to < 1. 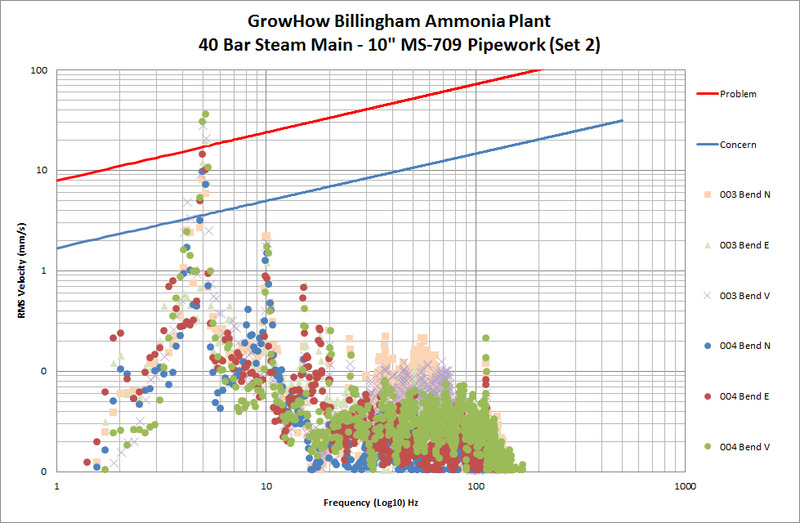 A pipework vibration problem was found to occur on 3 steam lines (4.5bar, 19bar 40bar) when the Ammonia plant was operated most efficiently with reduced steam export. With the 4.5bar 18” NB, 19 & 40bar 10” NB lines operating at temperatures up to 460°C the challenge was to reduce the levels of vibration whilst accommodating the large thermal expansions which were expected to be up to 100mm. Following a review of the most practical methods for reducing the vibration on the steam pipework loops and taking into account the high operating temperatures AVT recommended the use of GERB Visco-dampers. As the success of the damper installation relied on the ability of the structural steelwork to have sufficient stiffness to withstand the damper loads, AVT carried out preliminary work to assess what would be required in terms of new structural steelwork to support the dampers operational loads. Following this work, the client arranged for the plant steelwork civil drawings to be drawn up by a 3rd party with AVT being involved to make further comment, recommendations. For the large 18” pipework AVT recommended the large GERB RHY80 pipework damper and RHY40 for 10” lines. To accommodate the large pipework thermal expansions the dampers were specified with a ‘cold’ condition offset so during plant operation the dampers would operate within range. AVT was responsible for designing the damper to pipework bracket and specifying a suitable thermal barrier to reduce heat transfer from hot pipework to damper which would affect it performance. AVT performed a vibration assessment on an anhydrous ammonia line and found high vibration levels above the Energy Institute ‘Concern’ limit. 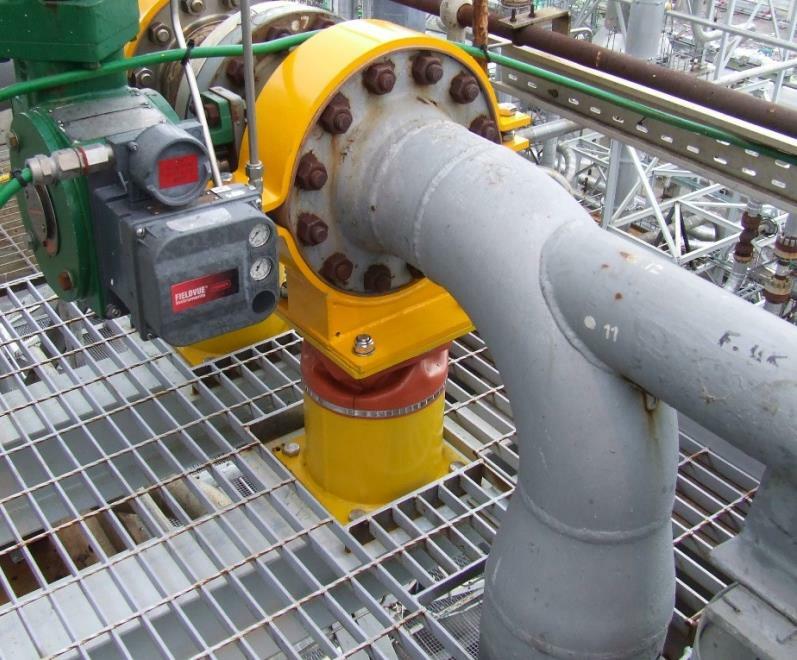 Because fixed supports could not be used in order to accommodate significant thermal expansions, AVT recommended the use of Visco-Elastic Dampers (VED) to reduce pipework vibration response amplitudes and also the corresponding high stress levels at the nearby nozzle connection into a vessel. The vibration survey indicated that the pipework vibration was predominately in the horizontal plane effectively rotating around the valve centreline. AVT subsequently recommend that two dampers were used either side of the valve to counteract this pipework rotational vibration. 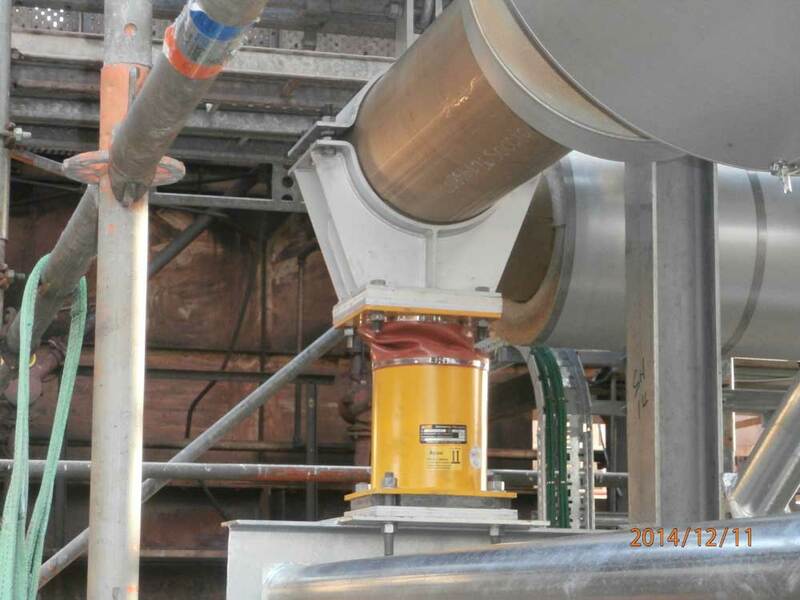 AVT designed the damper installation to fit onto the pipe flanges either side of the valve. The solution required the client to install additional beams to support the dampers. 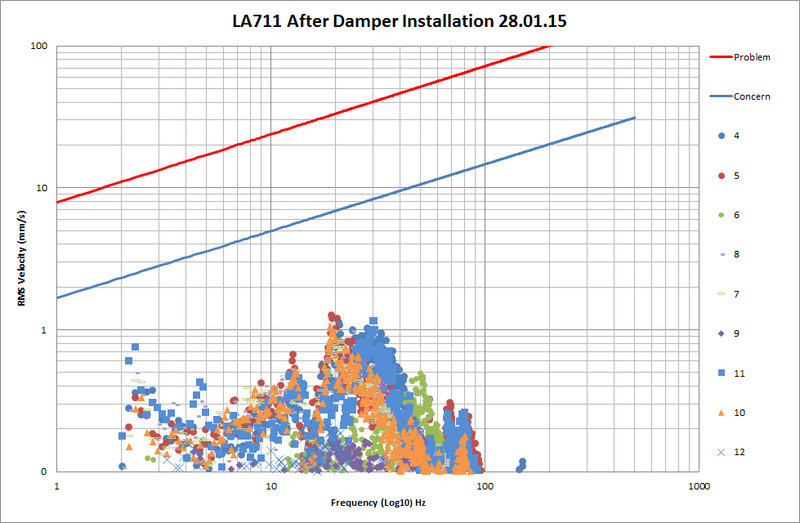 The damper installation resulted in a significant reduction in vibration levels which was confirmed by before and after vibration measurements as shown below.